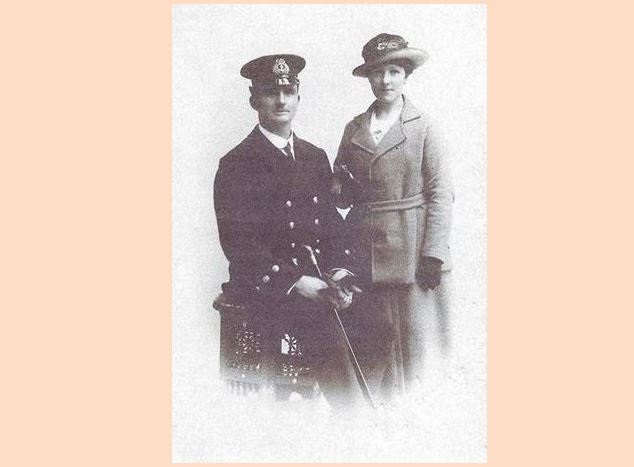 Mary Burgess with her husband Lieut. E.G. Burgess, RN. Mary Burgess (nee Haire) passed away on 28 November 1958 aged 71. Mary was born on 15 December 1886 in Loudon Street, Dundonald, Irvine, Ayrshire, Scotland and moved to the Isle of Wight in the 1920's following marriage to Ernest Burgess, a Petty Officer (later Lieutenant) of the Royal Navy at the Grand Hotel, Glasgow on 1 July 1916. Before moving to the Island they had a son Bruce and daughter Diana followed in Ryde. 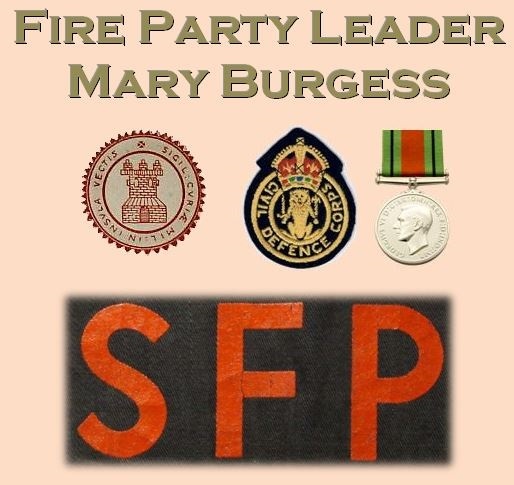 During the Second World War Mary was appointed as Fire Party Leader for the Monkton Street area of Ryde where she lived at various addresses throughout her life on the Island. At that stage the role of the Fire Party's was inherently linked to that of the fire services. They were the eyes and ears that remained exposed to danger during raids in order to rapidly identify the fall of the 1kg incendiary bombs that the Germans were able to drop 700 at a time from a single container of which most of their bomber aircraft were capable of carrying six. This potential for thousands of fires to appear in a matter of seconds was well beyond the means of the fire service to identify and attend. The Street Fire Party's job was to go direct to the drop sites and assess the severity of the hazard. They were trained to suppress the fires at source using sandbags or stirrup pumps and the idea was for them to filter out the low risk fires and alert the fire service only to those fires that were greater than their capability to deal with. This is a much overlooked facet of civil defence of the period as for sure they would have stopped more fires than the actual fire service and often in conditions of considerable danger. It was not uncommon for them to find themselves scrambling on to roof tops to access incendiaries caught in guttering or roof valley's. Records show that the gender balance in the fire party's was fairly equal, women such as Mary took leading roles in delivering this absolutely essential yet undersung voluntary service. The role that Mary and others like her played flatly refutes the official opinion of the administration that women didn't fight fires. So successful they became at dousing the malevolent intent of the fire bombs that the German's modified a random number of them to include a time-delayed mild explosive. This additional threat added to the number of street fire party fatalities and woundings as they had to get in close proximity to prevent the incendiary taking effect. In her spare time Mary was a founding member of the Afternoon Guild and its first Honorary Secretary. She was a capable musician and member of the Ryde Philharmonic Society where she played piano and violin. Mary passed away at home, 96 Monkton Street, on 28 November 1958 and her funeral was held at Binstead cemetery on 2 December attended by her husband and children. Rest in peace Fire Party Leader Burgess. An example of a street fire party at work.